Where are the Black League of Legends Characters? In November 2011 League of Legends boasted more than 11 million active players all over the world. With almost 100 unique characters for players to choose from and bi-monthly additions to the roster, the studio behind LoL, Riot Games, has quite a diverse crew on its hands. The game's roster isn't diverse enough according to an avid LoL forum poster named Eserine. He crusades regularly to draw attention to the need for, as he said in one of his posts, "more racial representation of Earth ethnicities within the game League of Legends." "As a senior concept artist at Riot (and Champion Lead), I've had a chance to help create many of our Champions. I've never really looked at it that way – while we have taken some specific inspiration (the city-states of Ionia and Demacia have particular mythological inspirations), League of Legends is a highly diverse fantasy world with a cast that includes robots, yetis, and a grouchy tree. It's not meant to look or feel like real life on Earth." In an email correspondence with me Eserine responded to Gonzales, saying "How odd by mere coincidence French accents, scuba divers, motorcycle gang membership, broadswords, Christmas, Chinese New Year, and vampires named Vladimir all happen to carry over...but somehow not black or brown people!" League of Legends borrows mythological characters from all over the world, from Medusa to Sun Wukong, and recreates them in-game. Riot also throws in heroic archetypes—like pirates and ninjas—as well as some completely original characters. Out of the 93 characters to choose from (as of March 4th), I counted 39 human-looking characters (more if you have a looser definition of "human"). Out of those 39, I could only find two characters who didn't look Caucasian or East Asian, based upon their portraits. As a daily LoL player myself, Eserine's point rang true. Being able to play as a squirrel person, robot, or bear certainly makes for good times but it seems odd that I can't play as a black human. Humans form a sizable chunk of the roster, yet most of the diversity is relegated to humanoid/monster characters. Even if LoL is not meant to be realistic, the fact of the matter is that humans do exist in the game. Why should those humans only look Caucasian or East-Asian? There is no "dedicated" black human League of Legends character. I say "dedicated" because each champion in the game has "skins", or alternate costumes, and while the character, Ryze, pictured here may be considered black in one of his skins—a skin that you can't buy anymore—he also happens to be purple and Caucasian. His default skin is the purple one. This lack of a dedicated black character, in itself, is not the problem. The problem that Eserine points out in one of his many forum posts is that "those of darker ethnicity each have lighter skins available, but none of the Asian and Caucasian-based champions have darker skins." Look at Caitlyn (pictured here), who never changes the color of her skin, despite the number of character "skins" she has. This inconsistency across characters makes it difficult to argue that LoL seriously considers any of their characters black. 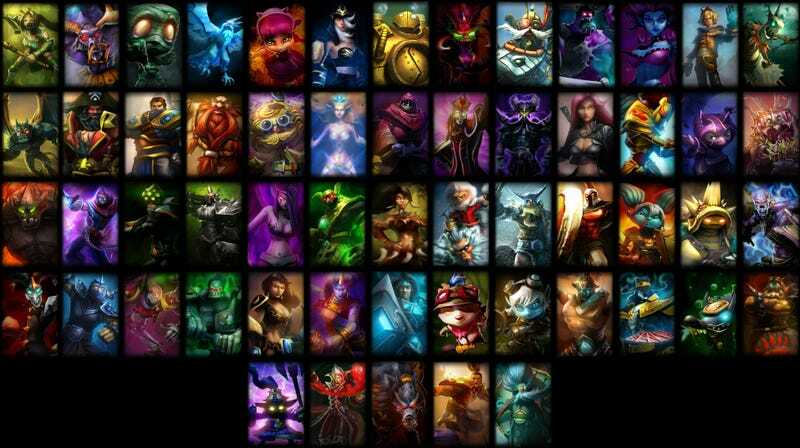 Given the size of the roster and frequency of the game's updates, it seems odd that Riot hasn't made a black champion along the way. This addition would help them appeal to a larger audience, settle a frequently-revisited topic in the community, and, really, there's just no reason not to do it. Plenty of African, Caribbean, etc. myths contain characters who would fit into LoL just fine; Anansi, a spider that also appears as a man, or Shango, a thunder god who plays the drums are prime examples. Certainly the latter sounds like he could be a mechanically interesting tank. Riot is not alone in their unintentional oversight. Other MOBA games, including Heroes of Newerth and Defense of the Ancients, tend to fall into the same trap. Even beyond MOBAs, this is a reality of most fantasy games. Think of League of Legends as a case study in a larger discussion about ethnicity in video games. Who Wants to Get Drunk League of Legends Style?